"De kjørte den flygende bilen til skolen." 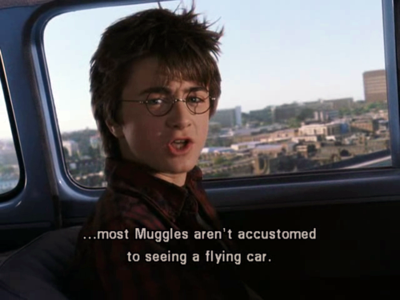 Translation:They drove the flying car to school. What I like most about the Norwegian course is that it is the most playful one of the duolingo courses offered! Lot's of references to popular culture and in some ways a bit nerdy, which makes it quite fun to learn. Thumbs up guys! WHERE DID YOU FIND a norwegian copy of LOTR??? I can't find a copy of Ringenes Herre anywhere! You'd have to ask my wife, but from what I know of her she probably got it at a fantasy books and games store that, if memory serves, went out of business about two years after I moved there. Sorry, man. It's out there though, I promise. tusen takk, jeg vil fortsette å søke! If you google the ISBN number 9788210050961 you'll find it in several stores, but the real challenge is finding one that's willing to ship abroad. I said that they flew the flying car to school (since it was, you know, flying, and I think that should be the verb used in this sentence. I know it's kjørte but it's not as if they were really driving. In all seriousness though, using "å kjøre" sounds better to my native ear than "å fly" when we're talking about a car - even in this setting. This also avoids the somewhat awkward/redundant phrasing of "å fly en flyvende bil". Just wondering: Is å kjøre used for any action of steering any sort of vehicle (car, boat, airplane etc.)? Yes, it's used with all vehicles I can think of at the moment, though there's often a more specific verb option available as well. In the case of planes, "å kjøre", "å fly" and "å styre" would all be valid options. I am a non-native resident, but: I believe that is the case, yes; I know "å kjøre" is used for boats, but am unsure about planes. I may be showing my age with this statement, but I immediately thought of the opening line to a classic cartoon jingle "Meet George Jetson!" do you actually pronounce the g in flygende? There are two spelling variants of the verb, making both "flygende" and "flyvende" possible options. You may pronounce it with either a "g" or a "v", but either way it's not silent. "Den engelske dramatikeren skrev trettisju skuespill." "Uglene bærer brev fra skolen." "Heksene oppdaget en flygende hval." "Hvorfor snakker hun til de andre passasjerene?"